Tourists and visitors from the UK are usually surpriced to see that some trains in Spain are double decker trains. Barcelona to Valencia takes under 3 hours. Barcelona to Alicante 4hr 45min. This is the local Narrow Gauge coastal railway. Alicante - Benidorm - Denia train is a private small gauge railway with an hourly service between Alicante and Benidorm, and less frequently trains to Denia. The railway station is in on the Avenida de Villajoyosa on the West side of Alicante, near the sea front. Note: This is a separate station from the main railway station in the centre of Alicante where the RENFE national railway trains run from. The railway station is in on the Avinguda De Beniarda, just under 2km inland of Benidorm old town. 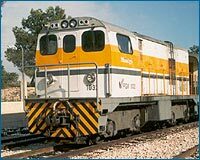 The Lemon Express , a tourist train, used to run on the FGV line but stopped running several years ago. The same journey, with its mountainous scenery can be done on the modern trains at a far lower cost. The Trensnochador a spanish nick name based on Train and Night-owl. A late train service serving the night time party goers along the coast. There is a network of Coach services throughout Spain. Usually the services are more frequent and shorter in distance than the rail services. National Express run services to Spain via there Eurolines network. Includes year round services to Alicante, and Summer only service to Benidorm. Taxis are fairly cheap and metered. Display a green light or 'libre' sign when available to hire. A small tip should be given.